I hate fantasy football. It takes football--a fun excuse to drink beer, eat junk food, and yell at the television--and turns it into some sort of competition. I hate fantasy football, which is why every year I say I'm not going to do it again. Then I do it anyway. I first played fantasy football in 2007. My not-yet-husband's buddies needed another team for their league. They asked me because they knew I was a football fan. But I was not a football fan. I was a Steelers fan. I watched very few other games. Despite my shallow knowledge I dusted off my rarely used Yahoo account and joined the league for my first fantasy football season. 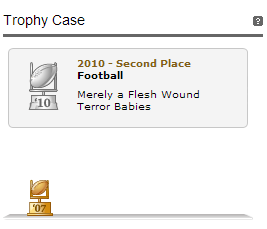 I could use a few more trophies for this case. I liked fantasy football. It was fun to have a reason to care about more than one game a week. It was fun being the only girl in the league and taking 3rd place. But moderate success with fantasy football increased my competitiveness. And my increased competitiveness meant increased stress. I would agonize over my line up. I hated to lose, but what I hated even more was losing with points on the bench. If I lost a weekly match-up that I could have won had I started a different player I would obsess about it for days. The year my son was was born I chose not to do fantasy football. I was tired and focused on caring for a 6 month old. The next year I came back and took 2nd place. The year my daughter was born I was going to quit fantasy football again. My husband proposed we co-manage a team. Co-managing with my husband just made fantasy football more stressful. We came in 12 out of 12. Each year I consider not joining the league. Each year I change my mind. Each year I am intolerable on Sunday mornings (and some Thursdays and Mondays). My husband tells me I shouldn't take it so seriously. I'm sure he hopes I don't take it so seriously in week 5. That's our match up. We had our fantasy football draft last weekend. Here are my picks, a.k.a. who I will be obsessed with until I hit the waiver wire. I tend to hit the waiver wire a lot.